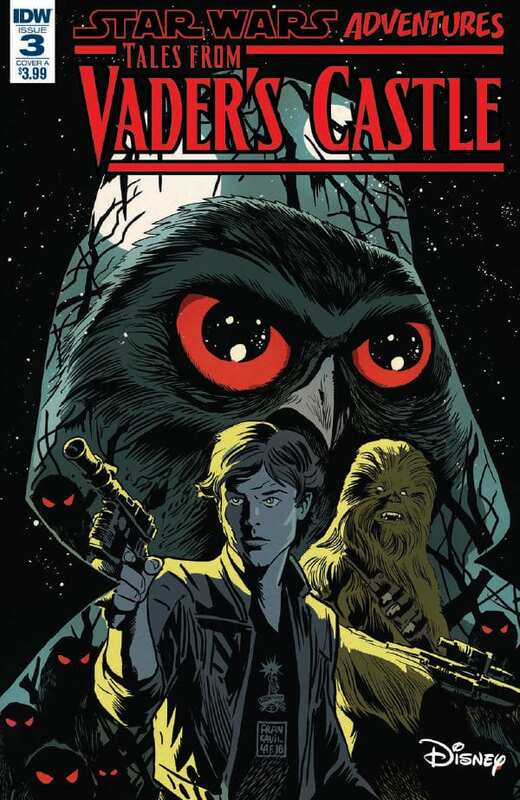 The latest Tales from Vader’s Castle focuses on everyone’s favourite scoundrel, Han Solo, as he gets caught up in a smuggling job to a mysterious moon where pilots have gone missing. Cavan Scott writes an entertaining adventure for Han and Chewie that captures their voices fairly well with artwork that seems inspired from the visual looks of Star Wars: The Clone Wars and Rebels. The story takes place in the early days of Han and Chewie’s smuggling careers, implied to be just a couple years after the events of Solo: A Star Wars Story. Scott manages to write the young Han as a convincing extension of Alden Ehrenreich from the spin-off film, displaying his youthful recklessness and cocky attitude on full display. Even Chewie is written well with his ‘dialogue’, characteristics and devotion to Han. The back and forth between the two is very much in line with their relationship in the films. The story itself moves along at a good pace and, even with the trappings of a supernatural witch, it feels like a typical adventure in the Star Wars galaxy. Corin Howell’s artwork and Valentina Pinto’s colours suit the issue’s atmosphere and is reminiscent of previous Star Wars cartoons with its visual look, particularly the character designs for Han and the witch Zalla. It may not match the art of the previous issue with its Dracula theme, but the issue nonetheless has some nice imagery. The main story has moved a little forward now that the characters are in Vader’s castle. 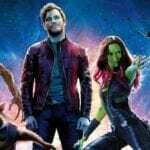 It’s still hard to connect to the characters since we’re only getting brief glimpses of them at the beginnings and ends of the issues. There were a couple cool moments with the most memorable being the big droid Gee-Three taking on a batch of Stormtroopers by himself. Derek Charm’s art has a similar style to Howell’s making it the overall art of the issue look pretty consistent. Star Wars Adventures: Tales from Vader’s Castle #3 is a fun issue that captures both the spirit of Han and Chewbacca and the visual look of various Star Wars animations. Scott’s writing moves at a fast pace with Han’s adventure and the main story as the characters get deeper into Vader’s castle. It doesn’t take full advantage of the spooky factor with Zalla’s powers, but its still an entertaining Halloween story that blends nicely with Star Wars.